This joyful Ganesha, a revered deity of the Hindu pantheon, gazes at you from a circular pendant. 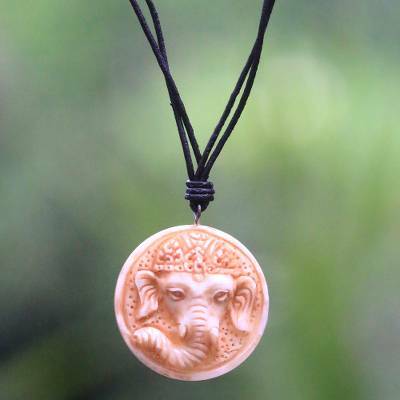 Made Wardika of Bali presents this pendant carefully crafted from cow bone on a dark brown leather cord. This pendant necklace features a sliding knot, allowing for adjustable length. Very talented artist. Carvings are intricate and unique. Love My Ganesha!! Thank You for sharing your wonderful talents with me.